This Storm Rolling Thunder 3 ball roller pairs the classic black and grey colors with a pop of bright lime to give it a modern element. 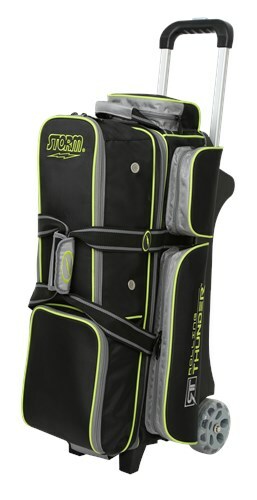 This high performance bowling bags has all the features you could possibly want from a base designed for stability and performance to high tech wheels and everything inbetween. Don't settle for second best, put this bag to the test! How many pairs of shoes could be carried in this bag? Hello Mark! This triple roller can store up to a size 15 in men's shoes. Due to the time it takes to produce the Storm Rolling Thunder 3 Ball Roller Black/Grey/Lime ball it will ship in immediately. We cannot ship this ball outside the United States.